A stylish, overlong letdown from Michael Mann about the Federal government's "first war on crime" targeting Pretty Boy Floyd (not Mayweather), Babyface Nelson, and Public Enemy Number One John Dillinger. None of the bank heists depicted have even a fraction of the pulse-pounding energy as the heists in Heat. The most interesting stuff in the picture is the background stuff involving J. Edgar Hoover (Billy Crudup) attempting to validate his plans to expand his Bureau of Investigations into what will become the FBI by capturing the notorious bank robbers. Meanwhile, the high public profiles of Dillinger and his ilk become a liability to the nationalizing gambling and crime syndicates that once gave them save haven. The life of a bank robber never comes off as exciting as Johnny Depp would have hat check girl Marion Cotillard believe as he whispers macho sweet nothings in her ear. 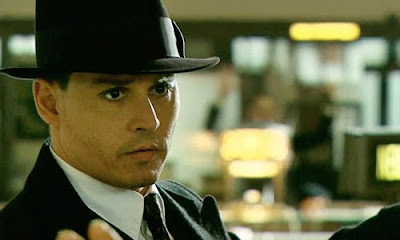 Nor is Depp himself, complete with disappearing pencil-thin mustache, as charming as Clark Gable, whom Dillinger is shown to idolize. Even with the film's 2 1/2 hour length, we barely get to know any of the characters, especially not Christian Bale as steely lawman Melvin Purvis. At least Bale never screams at anyone.